Clean, oil free, dry cotton cloths or pre-packaged surface cleaning lint free towels designed for solvent wiping. A clean, dry surface is essential to the success of any coatings application. Remember to clean before sanding. Sanding often melts greases and oils into the surface, making it difficult to obtain a clean surface. Note: Care should be used when wiping primed or painted surfaces which are not fully cured. Awl-Prep wipe down products can attack an epoxy or urethane coating as well as some polyester fillers which are not yet fully cured. Usually an epoxy or urethane surface which be sanded is cured enough to be wiped down with Awl-prep surface cleaning solvents, but not de-waxing or degreasing solvents. Polyester fillers are often sensitive to the types of solvents in the AWL-PREP product line. Always check a small area before beginning the two cloth method on a primed or topcoated surface. Two Cloth Cleaning Method. Surface should be clean of all dust. Use a vacuum to remove dust or use clean dry compressed air to blow while wiping with clean, oil free, dry cotton cloths. 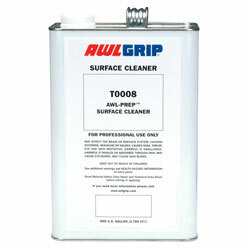 A majority of dust and dirt should be removed before wiping down with an Awl-prep wipe down solvent. Soak one cloth in the Awl-Prep solvent. Wet the surface with this cloth. Use a dry second cloth to wipe the surface dry and lift the contamination off the surface. Work in small areas (4 sq m or less) to keep the surface cleaner from drying before the second rag wipes the surface clean and dry. Repeat until surface is residue free. Note: Wiping with one wet cloth only smears contamination around. Be sure cloth used is clean. Surface must be dry before using tack rags.